I have been stitching some. I finished up Sea to Shining Sea "Mountains." I plan to get "Midwest" started soon. Birds of a Feather "My Betrothed Sampler"
Birds of a Feather "Sally Spencer Sampler"
Birds of a Feather "Happy Hearts Sampler"
Birds of a Feather "Bitter Flower Sampler"
I really, and I mean *really* LOVE those dyed fabrics...so can you e-mail me and tell me how you do yours? What the concentration of the dye is...cold vs. hot...I mean Nicole....I LOVE them! I think you've chosen perfectly with what you've "kitted" together...go for it. ok, I "HAVE" to get Sea to shinin sea now! I was going to order last night and never did but I'm going to now....I love this and you did a wonderful job! 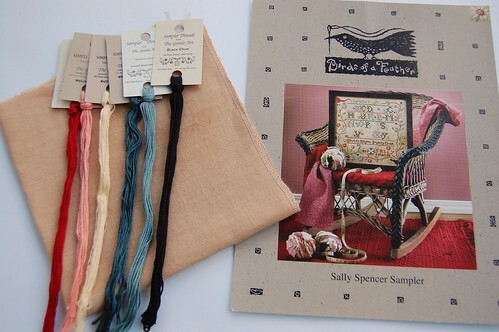 Lovely photos of stitching as usual, the dyed fabrics look scrumptious, and I look forward to seeing your BOAF stitching! Your stitching is beautiful. All those BOAF designs you have kitted up a great. Love Sea to Shining Sea. I haven't even finished the first block yet. OY! Love the BC one as well. and i think you kitted up the fabrics great with the floss for your next choices. 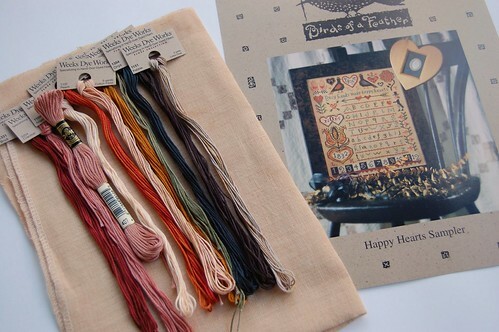 Your stitching is beautiful and I'm TOTALLY and I do mean TOTALLY in love with your dyed fabrics! You did a great job on them. Mine never turn out that good. Perfect! Great colours on your dyed fabrics! I love "the Seasons of Change Row" and "Sea to Shining Sea". Wow! Your dyed fabbies look great! Unfortunnatelly I don't know this paint, can you show a photo about it, please? And wonderful patterns you chose! Both of your WIPs are gorgeous Nicole! You've got some lovely projects kitted up too. I just so enjoy reading your blog. 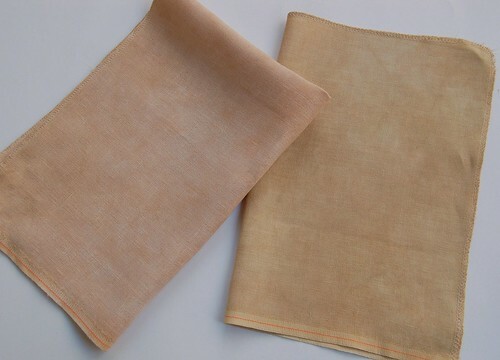 The dyed fabrics are wonderful, I have some white linen I may try to dye. 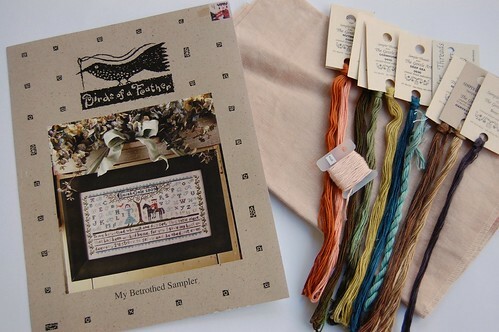 Love all the pieces you kitted, the Betrothed Sampler is one of my favorites. I am using the border on one of my round robins. Both of your WIPs are lovely. Great job on your fabric too. Beautiful pieces you have kitted. 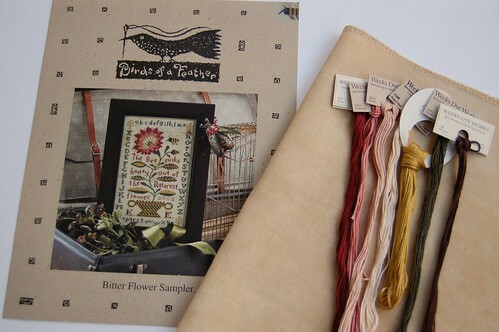 I'd like to get to Bitter Flower Sampler this year....maybe! Beautiful job dyeing your fabric. It looks amazing. I have never had the courage to do anything other than coffee and tea staining. I, too, love your dyeing results. If you're willing, could you also e-mail me with the info about how you did them? 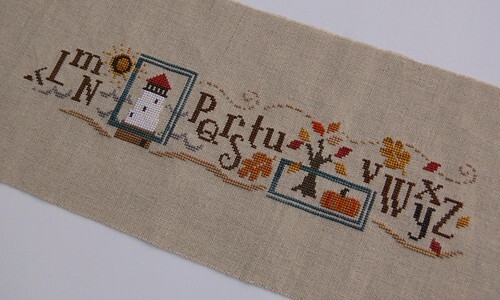 I especially love the yellow/tan combo on the 40 count, and I like the mottling effect you achieved, too. Any details you could share would be most welcome!! I love your sea to shining sea. I started mine on Tues. Can't wait to start on just one house. I'm trying to be good and doing the borders first.Your fabrics turned out beautiful. I have a small start on a sampler wall and have dreams of expanding it too. Nice stitching! 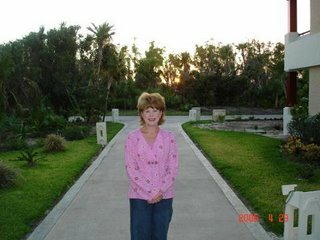 I just agree with then others - you were doing a wonderful dying job. I wish I could do that, too. Both your WIPs look fantastic. And what you have kitted is just as great, some great BOAF charts. I love kitting up future projects, it's just anticipating the fun of starting something new. Love your taste in charts! Your wips are so beautiful and love your kitted pieces!